Since its inception, the present National Democratic Alliance government under Prime Minister Narendra Modi has stated its intention to provide 24x7 electricity to all. “India already has an installed capacity of 250 GW, dominated by fossil fuels; the additional electricity demand creates a massive opportunity for renewable energy resources,” Modi said in a press release. On November 17, Union renewable energy minister Piyush Goyal made an important announcement, “What we inherited was 20 gigawatt (GW) up to 2022, which we are trying to reset to 100 GW...we see enormous potential on the solar front...” Even though the government sees potential in it, the solar sector in India is currently not looking that bright. Investments have declined in the past few years. In 2012, only $1.8 billion (Rs 9,676.94 crore) was invested in solar power in India, which declined to $1 billion (Rs 5,895.27 crore) in 2013. This is despite the fact that the capital cost of solar photovoltaic (PV) projects has reduced by almost 60 per cent since January 2010, when the Jawaharlal Nehru National Solar Mission (JNNSM) was introduced. Chandra Bhushan, deputy director of the Delhi-based NGO Centre for Science and Environment (CSE), says, “The decline in investments in renewable energy was largely because of policy uncertainty within the Ministry of New and Renewable Energy (MNRE). “India needs $30 billion (over Rs 1.91 lakh crore) investment in the renewable sector every year but received only $6 billion (about Rs 35,155.63 crore) in 2013,” UpendraTripathi, secretary, MNRE, said in September. MNRE’s policies have not been able to persuade Indian banks to provide loans for solar power projects. Development in the sector has also been deterred by high interest rates. Local banks are reluctant because they fear cash-crunched discoms will not be able to pay for the solar feed-in tariffs. “The power purchase agreements signed between developers and discoms are not bankable because there is no certainty whether the produced power would be bought by the discoms,” says Harish Ahuja, President, Strategy and Corporate Affairs at Hindustan Power Project, one of the developers of solar power projects. To revive the industry, MNRE wants the government to back a loan of €1 billion ( Rs 7,953.78 crore) sought from German bank KfW to promote rooftop solar systems of 1.6 GW capacity across the country. The World Bank is already collaborating with the Solar Energy Corporation of India (SECI) for financing an ultra- mega solar project in Madhya Pradesh. Coal India recently signed a memorandum of understanding (MoU) with SECI to install 1 GW solar power plants in the solar parks in different parts of India. NTPC, the largest power producer in India, has about 4 GW of solar power projects in various stages of development across India. India needs to achieve 100 GW by 2022 as per the plans of the Modi government. By September 2014, the installed capacity of solar power was 2.76 GW. The capacity needs to grow more than 12 GW every year to meet the target in the next eight |years. “Developing at the rate of 12 GW in a year would also mean 12 times the supply of modules, 12 times the amount of capital-both debt and equity, 12 times more human power and enormous land management to support such growth,” says Raghunath Mahapatra, vice president, strategy, Welspun Energy. Such increases have to be planned meticulously. “A 100 GW sounds like a good idea, but implementation of this target is an important aspect. Is the government machinery capable of providing the policy support, stability and dynamism that is required?” questions Ahuja. As of now, there are no plans for the improvement of the existing transmission lines to accommodate more of the intermittent power that solar would be. Adding 100 GW of solar energy would mean increasing the proportion of intermittent renewable power in the national grid. Given the lack of motivation and huge financial losses of the existing state discoms, they are reluctant to improve the transmission network that would be required to incorporate such big changes in their system. The biggest challenge would be the rooftop programme. MNRE is implementing the Grid Connected Rooftop and Small Solar Power Plants Programme where rooftop solar systems of capacity 1 kW to 500 kW in residential, commercial, institutional and industrial buildings are connected to the national grid. The programme has a provision of financial aid of Rs 24 per Watt from the Centre to encourage consumers to install solar rooftop systems. However, the problem arises over the issue of surplus power. Extra power produced by a rooftop solar system, which is not consumed by the producer, can either be stored in batteries to be used at night or can be transferred to the national grid. At least that is what the Centre envisions. But transferring the power to the national grid would require state discoms’ support and only four states have announced their rooftop policies so far. “It is easier for the government to focus on large-scale utility solar projects; the biggest challenge would be enhancing rooftop solar installations given the fact that there are serious hurdles to be crossed-capital support, grid stability and development, storage technologies and manpower requirements,” comments Jasmeet Khurana, head of market intelligence, Bridge To India Energy. “Ambitious targets are a good sign, but the government needs to back that up with reforms in regulation and electricity market that can support such scaling up of solar power. This is one of the reasons Solaire direct is reluctant to enter the rooftop solar market,” says Gaurav Sood, managing director of Solaire direct India, one of the developers that has set up projects under JNNSM. The government may not achieve the target without announcing new incentives for solar power developers and equipment manufacturers. Streamlining the rooftop solar programme is important along with the idea of decentralised distributed generation because there are still more than 300 million people in the country with no access to electricity. 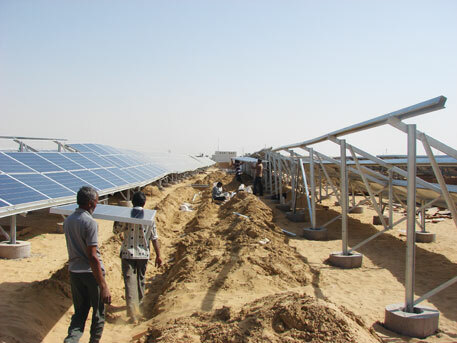 All the expansion in the solar field has been on account of large -scale projects feeding the grid. But that does not guarantee basic energy access to all. “The biggest social and economic impact of renewable energy will be providing clean energy to the energy- deprived. But there are no incentives focused on developing decentralised energy access solutions,” says Bhushan. The general view is that an ambitious target is not enough. The government should make sure that the supporting institutions, both financial and regulatory, are also developed to meet the target. Low-cost financing, along with payment guarantees for the developers, is essential to increase investment in the sector for solar power to achieve grid parity. A few steps taken at the right time can ensure these projects become viable soon. Of late it is more talk and less action in Solar Energy. What is surprising is that today, there is not a single gram of polycrystalline silicon and not a single wafer is being produced in the country. These are the basic starting materials for making solar cells and modules which produce electricity from sun light. Today, the cost of PV modules is about $ 0,5 per watt. Hence for 100 GW, the foreign exchange required is about half of a trillion US $. Our balance of trade is already precarious. Imports of solar modules will make this still precarious. Moreover, our country would be dependent on China for all its needs of PV modules which is really not good from a strategic point of view. Way back in 1986 we had established facility for producing polysilicon and silicon wafers which were competitively priced, excellent in quality and were sought off by all solar cell producers in the country. Unfortunately this has been killed and today we do not have any base for these materials. Should the government not consider making this in India? I was elated thinking that the incumbent government has eventually grasped the power crisis scenario of the country as it is coming up with the ambitious targets.But the article(Its nice but not sunny,Jan 1-15)made me learn the pragmatic hurdles the country is confronting in the solar energy sector like policy uncertainties and power purchase agreements. Albeit Rooftop solar system is a good initiative it is equally important to sensitize the people regarding this project.If the government can find out the root causes of the problem in the solar energy sector and address them effectively, it can take the credit of a Solar Revolution in the country. Can U inform more about it? Can U inform more about it? Where this was done in 1986?